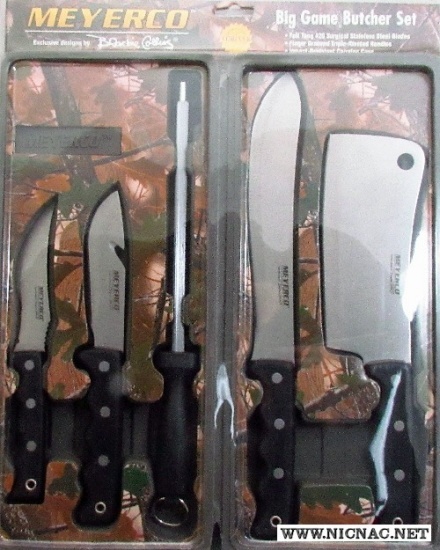 Meyerco Big Game Butcher Set Designed by Blackie Collins MC3463 Includes 7" clever, 8" butcher, 4 1/2" guthook skinner, 4" upswept skinner and 7 1/2" sharpening steel. Knives feature stainless blades and black finger goove composition handles. Impact resistant carrying case. Designed by Blackie Collins. Country of Origin: China Handy set for home or camping and an AWESOME BUY!!!! !